Solutions is the operative word at Weaver Golf & Sports Turf Solutions. We work together with architects, contractors, superintendents and those directly responsible for keeping their golf courses or sports fields in the best possible condition. Our products are of the highest quality and can be tailored to meet your needs. The proper product applied to a golf course or athletic field, natural or synthetic can have a significant impact on the performance of the playing surface. We are proud to be exclusive distributors of The Best Sand Division of Fairmount Minerals, and D.M. Boyd, a Division of ArmsTurf Products. D.M. 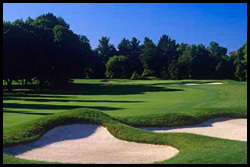 Boyd produces the highest quality topdressing sand available for bot dry and damp, and construction mixes used for golf courses and athletic fields. We have our products analyzed by an independent diagnostics firm on a regular basis to make sure they meet or exceed the recommended specifications of physical and chemical properties set by the USGA.